You’re a painter. What’s the worst thing that can happen to you: neglect, derision, disgrace? Worse than all these misfortunes is to have to mutilate your masterpiece, the bravest thing you’ve ever tried. That’s what happened to Rembrandt in 1662. That’s how Simon Schama introduces us to Rembrandt in his amazing book: The Power of Art. 20 years before, when Rembrandt was in his 30s, Amsterdam couldn’t get enough of the young master. “Over and over he had confounded expectations, and expectations adjusted accordingly to whatever it was he had done.” He was on top of the world. was living in a modest dwelling on the Rozengracht, opposite a pleasure garden. There were drunks in the street, knife fights on the corner. The tongue-clickers now saw him as someone from whom things had called steeply away: credit, property, the benisons of the mighty. God did not distribute fortune idly, so the truisms of the pious had it. Thus, in some fashion, Rembrandt’s fall from grace must have been ordained as a caution against sinful pride. But then a lucky break. The Amsterdam elite desired a monumental history painting for their new town hall. Govert Flinck, their first choice for the job, unexpectedly died leaving Rembrandt with an opportunity to redeem himself and change everything. The commission would be one of a series of paintings illustrating the history of the Dutch. Together the cycle of histories would remind Amsterdammers that, while they were not themselves masters of an empire, their history began with an act of virtuous insurrection against the arrogance of the Roman Empire. Rembrandt’s work would be the most important. 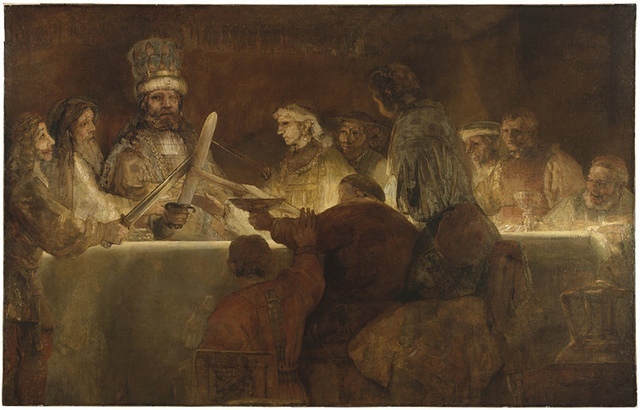 He would be painting the Batavian leader Claudius Civilis at “the very moment of swearing his brethren to pledge their lives to the liberty of the Fatherland.” If he succeeded, Rembrandt would clear his name and return to prosperity. The result was something no one expected and for the ruined painter it was a massive gamble. Everyone knew about Rembrandt’s ruffian audacity; his regrettable imperviousness to the niceties of decorum, personal and professional. But with all those reservations, the civic worthies must still have been unprepared for what they got from his hand. If Rembrandt wanted to rescue something from his masterpiece he would have to cut it down from the enormous arched space it was designed for into something for a residential buyer. So the cutting began. You can learn more about Rembrandt by watching this Power of Art BBC series . Still curious? Pick up a copy of Simon Schama’s, The Power of Art, or watch the excellent BBC series. Continuing my quest to learn more about Art, I present to you Gian Lorenzo Bernini — the Pope’s architect, the supreme sculptor of Rome, a man who practiced Jesuitical discipline every day. Where should we start? Can you look at this picture with an innocent eye? Years of what all sculptors had to do — study and draw from classical models — followed. Even boy wonders had to learn the rules. Bernini was only 15 when he made The Martyrdom of San Lorenzo in 1613. But his big break was just around the corner. When, in 1623, Maffeo Barberini become Pope Urban VIII he pounced and, unlike Apollo, got his way. Bernini was called into the papal apartments and given a famous acclamation: ‘It is your great good luck, Cavaliere [for Bernini had been knighted in the Order of Christ by Urban’s predecessor, Gregory XV], to see Maffeo Barberini Pople, but we are even more fortunate in that the Cavaliere Bernini lives in the time of our pontificate.’ It was now no longer just a matter of making sculpture for a private patron, even one as grand as Scipione Borghese. What Urban VIII had in mind for Bernini was nothing less than the remaking of Rome — its secular buildings, churches and fountains – always with the busy-bee emblem of the Barberini on it. Even for the officially acknowledged prodigy, brimful of self-confidence, this must have been a giddy prospect. To learn more about Bernini, watch Schama’s introduction to Bernini. Still curious? Pick up a copy of Simon Schama’s, The Power of Art, or watch the excellent BBC series. While you’re at it, check out E.H. Gombrich’s The Story of Art.